This 5.1-channel home theater system envelops audiences in sound from every angle, creating a richer audio experience while you're watching movies or listening to music. 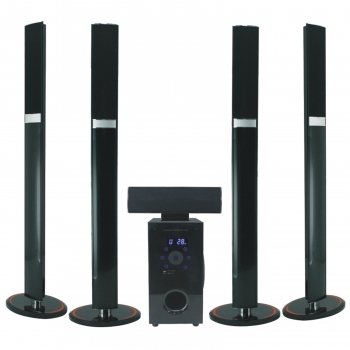 The sleek satellite speakers are floor-standing for easy positioning around the room without having to be mounted or frightened into clinging the wall. The subwoofer, which doubles as the receiver, has a built-in touch screen interface for controlling the system.